1) This paper describes the solutions and implementations chosen in establishing a geodetic basis, or geodetic infrastructure, for the construction work of the Fehmarnbelt Fixed Link; a tunnel which is being constructed between Germany and Denmark across the Fehmarnbelt. The Fehmarnbelt Fixed Link is a tunnel which is being constructed between Germany and Denmark across the Fehmarnbelt and is one of the larger construction projects in Europe at the moment. For such a large construction project a homogeneous and robust geodetic infrastructure is important. This paper describes the solutions and implementations chosen in establishing a geodetic basis, or geodetic infrastructure, for the construction work. The geodetic infrastructure consists of establishment of new permanent GNSS stations, selection of geodetic reference system, establishment of a geodetic reference frame, determination of mean sea level in the area, definition of new height system, determination of a geoid model, derivation of parameters for coordinate transformations to national reference frames in Germany and Denmark, definition of a map projection, and development of a transformation software. Finally, a network based GNSS RTK service has been established based on the geodetic infrastructure. The GNSS RTK service is used for precise positioning and navigation within the construction area. The paper describes the geodetic infrastructure and establishment and testing of the RTK service. Den faste forbindelse over Fehmarnbelt er en sænketunnel, som bliver bygget mellem Tyskland og Danmark over Fehmarnbelt, og er et af de større anlægsprojekter i Europa i øjeblikket. Ved så store anlægsprojekter er et homogent og robust geodætisk grundlag vigtigt. Denne artikel beskriver de løsninger og implementeringer som er valgt i forbindelse med etableringen af det geodætiske grundlag, eller den geodætiske infrastruktur, til anlægsarbejdet med den faste forbindelse. Etableringen af den geodætiske infrastruktur indebærer etablering af nye permanente GNSS-stationer, valg af et geodætisk referencesystem, etablering af en geodætisk referenceramme, bestemmelse af middelvandstanden i området, fastlæggelse af et nyt højdesystem, beregning af en geoide model, udledning af koordinattransformationer til de nationale referencerammer i Tyskland og Danmark, definition af en kortprojektion og udvikling af et transformations-program. Endelig er der etableret en netværksbaseret GNSS RTK tjeneste på grundlag af den geodætiske infrastruktur. RTK servicen bruges til præcis positionsbestemmelse og navigation i anlægsområdet. Artiklen beskriver den geodætiske infrastruktur samt etablering og test af RTK servicen. For large construction projects a homogeneous and robust geodetic infrastructure is important. A geodetic reference frame, a height system, a geoid model and a map projection is always needed for construction work. For large projects, the geodetic infrastructure may be defined and established especially for the project to ensure consistency and to avoid coordinate transformations, large distance or direction corrections etc. This paper describes how the challenge of establishing a new geodetic infrastructure for a large construction project across the border between Germany and Denmark has been handled. The work is challenging because the construction site lies in a border area where reference frames, height systems and geoid model in the two countries are not identical. Further, most of the construction site is offshore in the Fehmarnbelt between Germany and Denmark. The region is illustrated in Figure 1, with the construction area located in between the GNSS stations FEH1-4. The distance across Fehmarnbelt is here approximately 18 km. Figure 1. Eight permanent GNSS stations provide data for the RTK service established in the area. Station locations marked with green circles. Illustration: AXIO-NET GmbH. Coordination of the work is important when many organisations and people are involved. It is important that the work is correctly sequenced to eliminate or minimize the time lost between the various tasks. For this construction project it has also been important to make sure the geodetic infrastructure was available for the last parts of the pre-investigations and for finalizing the plan approval material. Therefore establishment of the geodetic infrastructure was initiated as one of the very first tasks in the pre-investigation phase. With this paper we describe the solutions and implementations chosen, starting with the establishment of new permanent GNSS stations, selection of geodetic reference system, establishment of geodetic reference frame, definition of new height system, determination of a geoid model, derivation of parameters for coordinate transformations to national reference frames, definition of map projection, and last but not least the establishment of a GNSS RTK service for precise positioning within the construction area. First, however the construction project is introduced in the next section. Figure 2. The Scandinavia-Mediterranean corridor. Location of the Fehmarnbelt Fixed Link is marked in red between Copenhagen and Hamburg. Illustration: Femern A/S. The Fehmarnbelt Fixed Link realises the dream of a fixed, closed and direct connection between Scandinavia and continental Europe. This will considerably reduce the travel time between Scandinavia and continental Europe. The Fehmarnbelt Fixed Link is part of the Scandinavia-Mediterranean corridor, which is a north-south route that will run from the Finnish-Russian border to Valetta in Malta (Figure 2). The corridor is considered to be important for the European economy and will tie Europe's growth centres together from north to south. The fixed link across Fehmarnbelt will be established between Puttgarden on the German island of Fehmarn and Rødbyhavn on the Danish island of Lolland. The Fehmarnbelt Fixed Link will be established as an immersed tunnel. It will be placed in a trench excavated on the sea floor, and covered with a layer of stones. The tunnel will be 18 km long and include both highway and railway lines. Planning and construction of the tunnel is managed by the company Femern A/S which is owned by the Danish Ministry of Transport. At the time of writing, geotechnical and environmental investigations are completed. Project plans have been submitted to the German and Danish authorities for approval, and the tendering process for the major construction work is ongoing. The geodetic infrastructure for the Fehmarnbelt Fixed Link comprises a 3D reference frame, a height system and a geoid model for deriving heights, a map projection for plane maps and drawings, and coordinate transformation parameters in order to connect to the national reference frames of Germany and Denmark. The geodetic reference frame for the Fehmarnbelt Fixed Link is based on four permanent GNSS stations established for the purpose. The GNSS stations were established around Fehmarnbelt and to obtain the most suitable geometry for the offshore construction site, two stations are located on Fehmarn in Germany and two stations are located on Lolland in Denmark (Figure 3). The stations have been established close to the construction area, but also at a sufficient distance to remain unaffected by the construction activities. The GNSS stations are established as geodetic grade stations. One of the GNSS stations is shown in Figure 4. Figure 3. 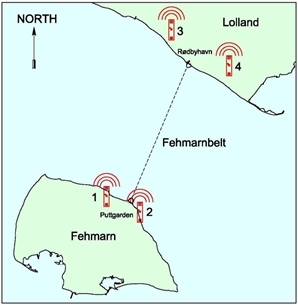 Approximate locations of the four permanent GNSS stations at Fehmarnbelt. Illustration: Rambøll Danmark. The foundation of the pillars reaches several meters into the ground to ensure long term stability of the stations. The monument head is bevelled at an angle of 30° from vertical in order to minimize signal multipath effects. The stations are equipped with individually calibrated GNSS choke ring antennae mounted on concrete pillars with a height of 3 meters. The GNSS stations are equipped with GNSS receivers which can process GPS, GLONASS, and Galileo signals. At the time of writing reception of Galileo signals has not yet been implemented, however, once a sufficient number of Galileo satellites are in orbit and operational, Galileo will also be implemented in the Fehmarnbelt Positioning System. All the electronic equipment necessary to operate the permanent GNSS stations are located in cabinets adjacent to the pillars. The cabinets contain GNSS receivers, access points to power grids, an uninterruptible power supply (UPS) to bridge power outages, communication equipment, and a heat exchanger to cool the cabinet. GNSS data is stored locally in the receivers and is transmitted in real time to a control center where the data is used for a real time kinematic (RTK) service. Communication between control center and the GNSS stations is carried out using the mobile telephone network. RTK correction data is returned to the GNSS stations and transmitted to RTK users via a Yagi antenna mounted on radio masts located directly north of the GNSS antennae. The radio masts are located north of the GNSS stations to minimize signal blockage since the satellite constellation at the latitude of Fehmarnbelt, around 54.6 degrees North, provides very few satellites in this direction. Establishment of the GNSS stations was carried out after an EU tender won by the company AXIO-NET GmbH in Germany with Allsat GmbH network and services as a major subcontractor. Once the GNSS stations were constructed the next step was to establish a geodetic reference frame and as a basis for that a geodetic reference system is needed. We decided to use the International Terrestrial Reference System (ITRS) (Tscherning, ed., 1992). This system is used for GNSS and using it we ensure a tight connection between the Fehmarnbelt geodetic infrastructure and the global satellite navigation systems. Because the ITRS is used globally it is also familiar to international contractors. The reference frame chosen is the ITRF2005 (Altamimi et al., 2007) which was the newest and most accurate realization of the ITRS at the time of definition of the reference frame. The four permanent GNSS stations described in the previous section form the local realization of the ITRF2005. This was achieved by using seven days of GNSS data from the four new stations along with data from six surrounding existing permanent GNSS stations of the network of the International GNSS Service, the IGS (Dow et al., 2009). Figure 4. 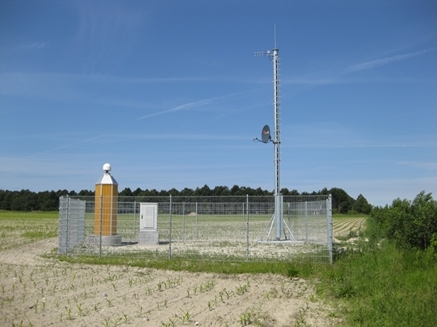 Permanent GNSS station on Lolland, Denmark. Photo: Anna B.O. Jensen. Coordinates for the new stations were determined by the Danish Geodata Agency relative to the IGS stations using the Bernese Software version 5.0 (Dach et al, 2007) developed at the University of Bern in Switzerland. Processing was carried out using the standard settings of the software which includes using the Niell model for estimation of the tropospheric delay, resolution of ambiguities using the quasi ionosphere free (QIF) strategy, daily ionosphere models from the Center for Orbit Determination in Europe (CODE), ocean tide models from Onsala Space Observatory, and final satellite orbits from the IGS. Hereby, the ITRF2005 was realised in the Fehmarnbelt area and a reference frame in three dimensions was established. To ensure continued stability of the GNSS stations, coordinates have been verified by re-processing at regular intervals. For each re-processing a new data set consisting of seven days of data is used. The data is processed in the current reference frame used for the IGS satellite orbits and transformed back to the original epoch of the ITRF2005 using a 7 parameter Helmert transformation. This has been carried out using a selection of permanent GNSS stations which have been included in both the original processing and the current re-processing. So far reprocessing of the station coordinates has not revealed any significant station movements since the stations were erected in 2010. The height difference between Germany and Denmark across Fehmarnbelt is known from a hydrostatic levelling between Puttgarden and Rødbyhavn carried out in 1987 (Andersen, 1992). For the Fehmarnbelt Fixed Link, precise levelling was carried out between the connecting points of the hydrostatic levelling and stable points further inland. Levelling points with large displacements since 1987 were eliminated. The hydrostatic levelling was then used for transfer of the height difference between Germany and Denmark. The next step was determination of present mean sea level in the Fehmarnbelt and establishment of a project specific height system with the zero-level of the height system as close as possible to the actual mean sea level of Fehmarnbelt. Water level data from Puttgarden in Germany and Rødbyhavn in Denmark was analyzed in cooperation with the Danish Geodata Agency and the Danish National Space Institute at the Technical University of Denmark (DTU-Space). Analyses of the last 20 years of water level data show an increase in the water level of approximately 2 mm per year at Rødbyhavn. The water level data was used for estimation of the present day mean sea level in Fehmarnbelt, and the zero level for the vertical reference system for the Fehmarnbelt Fixed Link was hereby set to coincide with mean sea level at Rødbyhavn in 2010. The zero level thus deviates from both the German and the Danish height systems with a few centimetres. After establishing the zero level, precise levelling was carried out by the Danish Geodata Agency to determine heights in the new vertical reference system for the four new permanent GNSS stations as well as for a number of existing control points in Germany and Denmark. In order to determine heights relative to mean sea level with GNSS it is necessary to utilize a geoid model. The Danish National Space Institute (DTU-Space) performed a few new gravity readings to supplement the existing gravity database. All existing gravity data from the area collected by German and Danish authorities was then used together with the new observations to develop a local geoid model for the Fehmarnbelt. The geoid model was computed by the GRAVSOFT system, a set of Fortran routines developed by DTU-Space and the Niels Bohr Institute, University of Copenhagen (Forsberg and Tscherning, 2008). The geoid model is fitted to the height system and to the ITRF2005 by the four new permanent GNSS stations, and the model is used for conversion between mean sea level heights and ellipsoidal heights within the area. For maps, charts, and drawings a map projection must be defined for the project. A Transverse Mercator projection (like ITM, UTM or Gauss-Krüger) was chosen. For a description of map projections see Bugayewskiy and Snyder (1995). The projection is fitted to the area in order to obtain a scale factor as small as possible within the construction area. Also a false Easting value was chosen to provide Easting values within the construction area which are different from Easting values of the ITM, UTM and Gauss-Krüger projections being used in Germany and Denmark. Hereby we hope to reduce the risk of accidentally using coordinates from a wrong map projection or reference frame. Finally, as the last part of the geodetic infrastructure, coordinate transformation parameters between the geodetic reference frame used for the Fehmarnbelt Fixed Link (ITRF2005) and the National reference frames used in Germany and Denmark (realisations of the ETRS89) were derived. There is a difference between the realisations of ETRS89 in Germany and Denmark, and even though this difference is only a few cm it is larger than the positional accuracy which can be obtained using the RTK service as described in the next section. It is therefore necessary with two sets of transformation parameters; one for the German and one for Danish implementation of the ETRS89. For each set, the variables for a seven parameter affine transformation were derived specifically for the relatively small construction area to achieve high accuracy. The transformation parameters were derived using coordinates of permanent GNSS stations and a number of 3D control points for which coordinates were available in the systems involved in the transformation. Transformation parameters along with map projection, reference system and geoid model were subsequently built into a transformation software developed by the Danish Geodata Agency. The software makes it possible to convert coordinates between the geodetic basis for the Fehmarnbelt and the national geodetic reference frames, map projections, and height systems used in Germany and Denmark. This software is also considered part of the geodetic infrastructure. To ensure accurate GNSS positioning a real time kinematic (RTK) GNSS service has been established. Establishment, operation and maintenance was awarded to AXIO-NET GmbH in Germany after an EU tender. In Figure 1, station locations are marked with green circles. FEH1 to FEH4 are the primary permanent GNSS stations established by Femern A/S. Secondary permanent GNSS stations are located in Nakskov (NAK1) and Gedser (GESR) in Denmark, and Kiel Holtenau (HOL2) and Rostock Warnemünde (WARN) in Germany. The RTK service is based on a network RTK approach using the GNSMART software (GEO++ GmbH, 2010). GNSS raw data is sent in real time from the GNSS stations to the control centre where processing of RTK correction data is carried out. RTK corrections are then sent back to the four primary GNSS stations and are transmitted to users in the construction area via UHF radio and via mobile network. With the use of a network approach, the RTK service is not affected if one of the GNSS stations breaks down because RTK correction data can be generated with a sufficient quality based on data from the seven remaining stations. In designing the system, a high level of redundancy has been achieved. There are for instance two different control centre's operating at two different addresses in Germany. Also the RTK service has been designed with a single station RTK backup solution. This means that if the connection between a GNSS station and the control centre is interrupted, then the GNSS station switches automatically to a single station approach. In such situation the GNSS station calculates its own RTK corrections and transmits these to the users. The data format used for transmission of RTK corrections is the RTCM version 3.1. This is used for RTK corrections generated both from the network approach and the backup single station approach. The RTK correction data is transmitted to users by UHF radio links on four different frequencies from the radio masts established at the new GNSS stations. But RTK corrections are also distributed via the internet using the NTRIP protocol. 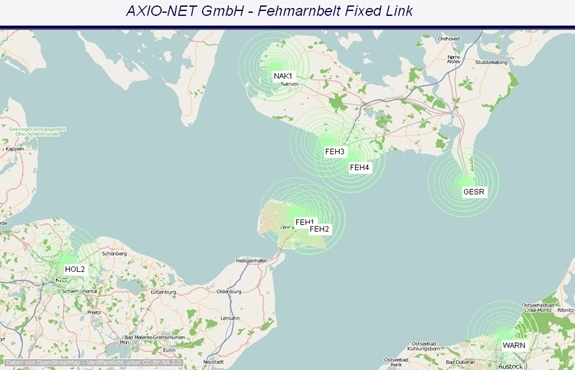 The radio link is used as the primary data link because the data communication is free and because a sufficient line of sight is available across the Fehmarnbelt. Mobile internet and NTRIP protocol is mainly used when working further inland where the topography may limit transmission of the radio signals. It is also used offshore by contractors who are more familiar with using the NTRIP protocol from other construction projects. One of the requirements for the RTK service is that the service should be available for, and useable by, contractors with different brands of GNSS RTK rover equipment. To verify that this was indeed possible, a test of different rovers was carried out in June 2014. We tested RTK rovers from Trimble, Leica, Topcon, and Javad considering that these brands will most commonly be encountered on the construction site. Only new equipment was used for the test and the equipment was rented from the various dealers in Denmark. For reception of UHF radio signals a SATEL radio modem was connected via cable to those receivers which did not have built in radio modems. The test showed that the RTK service could indeed be used with all four brand names of receivers and fixed positions were obtained using both radio and mobile internet (NTRIP). Time to fix ambiguities was comparable between units and acceptable accuracy was obtained when the equipment was tested at a few control points. Further, some changes to the transmitted RTCM data of the positioning system were tested such as switching GLONASS and/or MAC correction data off and on. Continuous maintenance is carried out to make sure the positioning system consistently meets the requirements set by Femern A/S. Maintenance includes re-processing of coordinates for the GNSS stations to verify station stability. Monthly inspections of the GNSS stations are carried out to make sure the stations, including hardware and communication lines, are continuously operating at their best. Considering the long term operation of the system, monitoring, and potential replacement of electrical parts is also carried out. Verification and control of the performance of the RTK service is also carried out at regular intervals by AXIO-NET GmbH who operates the system. During establishment and operation of the system, coordination, quality control and supervision is carried out by Rambøll-Arup-TEC JV and AJ Geomatics, authors of this paper, for Femern A/S. geodetic infrastructure and positioning system for the pre-investigations and construction work of the Fehmarnbelt Fixed Link. The geodetic infrastructure consists of a geodetic reference frame, map projection, height system, geoid model and coordinate transformations all defined and realised especially for the large construction project. A transformation software has been developed specifically for the project for easier use. Four permanent GNSS stations form the basis for the geodetic reference frame and are also used as the basis for an RTK service providing GNSS RTK correction data for precise positioning and navigation in the area. Several tests have been carried out during the establishment, and continuous surveillance and maintenance is carried out to make sure the system meets the requirements of the construction project. The approach described in this paper suggests the work process for establishment of a geodetic infrastructure for a large construction project. Other approaches could have been followed, but for this project the described procedure so far has worked out well. It has been advantageous for the establishment and testing of the geodetic infrastructure and positioning system, that work on this was initiated as one of the first tasks in the preparatory work for the Fehmarnbelt Fixed Link. All of the work described in this article is funded by Femern A/S, and many public and private organisations in Germany and Denmark have been involved in the work. AXIO-NET GmbH is the lead contractor responsible for establishment and operation of the permanent GNSS stations and operation and maintenance of the RTK service. Allsat GmbH network and services managed establishment of the permanent GNSS stations and provided GNSS hardware. Richter Deformationsmesstechnik GmbH established the GNSS pillars, radio masts, cabinets etc. of the permanent GNSS stations, and Ohms Nachtigall engineering GbR performed geo-technical investigations at the sites of the GNSS stations prior to establishment. The Danish Geodata Agency has been involved in most parts of geodetic work and has performed much of the geodetic survey activities and much of the data processing and analyses. The Danish National Space Institute (DTU-Space) developed the geoid model and contributed to definition of mean sea level. The Federal Agency for Cartography and Geodesy in Germany (BKG) and the Land Survey Office of the State of Schleswig-Holstein in Germany has supported much of the work on the geodetic infrastructure. Disclaimer: The opinions and conclusions presented in this paper do not necessarily cover the opinions and conclusions of Femern A/S. Altamimi, Z., X. Collilieux, J. Legrand, B. Garayt and C. Boucher, 2007. ITRF2005: A new release of the International Terrestrial Reference Frame based on time series of station positions and Earth Orientation Parameters. Journal of Geophysical Research, Vol. 112, B09401, 19 pp. Andersen, N., 1992. The Hydrostatic Levelling Across Fehmarn Belt in 1987. Publications 4th Series, National Survey and Cadastre – Denmark. Bugayewskiy, L. M., and J. P. Snyder, 1995. Map Projections, a Reference Manual. CRC Press. Dach, R., U. Hugentobler, P. Fridez and M. Meindl (eds. ), 2007. Bernese GPS Software Version 5.0. User manual of Bernese GPS Software Version 5.0. Astronomical Institute, Univ. of Bern. Available for download at www.bernese.unibe.ch/docs/DOCU50.pdf. Forsberg, R and C C Tscherning, 2008.Overview manual for the GRAVSOFT Geodetic Gravity Field Modelling Programs, 2nd Ed. Technical report, DTU-Space, Technical University of Denmark. Tscherning, C.C. (ed. ), 1992. The Geodesist's Handbook 1992. Bulletin Geodesique, Vol. 66, no. 2. Anna B. O. Jensen is professor in geodesy at KTH - Royal Institute of Technology in Sweden, and owner of AJ Geomatics in Denmark. She holds a Ph.D. in geodesy from the University of Copenhagen and has worked with research and development in geodesy and GNSS for more than 20 years. Anders Almholt is a senior analyst at Rambøll Danmark. He holds a M.Sc. degree in geophysics from the University of Copenhagen and has worked with ground engineering for more than five years.